The NetIDE Network Engine enables portability and cooperation inside a single network by using a client/server multi-controller SDN architecture. Separate “Client SDN Controllers” host the various SDN Applications with their access to the actual physical network abstracted and coordinated through a single “Server SDN Controller”, in this instance OpenDaylight. This allows applications written for Ryu/Floodlight/Pyretic to execute on OpenDaylight managed infrastructure. An initial suite of SDN Client Controller “Backends”: Floodlight, Ryu, Pyretic. Further controllers may be added over time as the engine is extensible. encapsulate messages specific to a particular SBI protocol version (e.g., OpenFlow 1.X, NETCONF, etc.) towards the client controllers with proper information to recognize these messages as such. The NetIDE packages can be added as dependencies in Maven projects by putting the following code in the pom.xml file. The current stable version for NetIDE is 0.2.0-Boron. Messages of the NetIDE protocol contain two basic elements: the NetIDE header and the data (or payload). 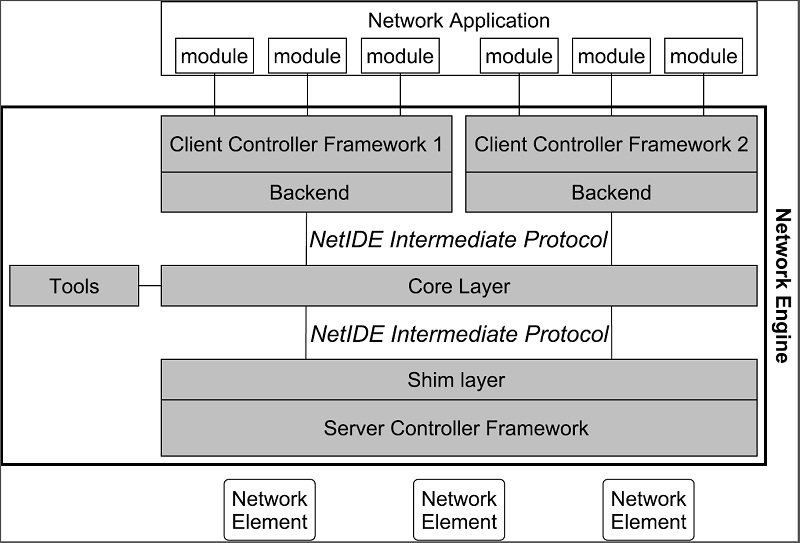 The NetIDE header, described below, is placed before the payload and serves as the communication and control link between the different components of the Network Engine. The payload can contain management messages, used by the components of the Network Engine to exchange relevant information, or control/configuration messages (such as OpenFlow, NETCONF, etc.) crossing the Network Engine generated by either network application modules or by the network elements. netide_ver is the version of the NetIDE protocol (the current version is v1.2, which is identified with value 0x03). length is the total length of the payload in bytes. datapath_id is a 64-bit field that uniquely identifies the network elements. module_id is a 32-bits field that uniquely identifies Backends and application modules running on top of each client controller. The composition mechanism in the core layer leverages on this field to implement the correct execution flow of these modules. xid is the transaction identifier associated to the each message. Replies must use the same value to facilitate the pairing. The first operation performed by a Backend is registering itself and the modules that it is running to the Core. This is done by using the MODULE_ANNOUNCEMENT and MODULE_ACKNOWLEDGE message types. As a result of this process, each Backend and application module can be recognized by the Core through an identifier (the module_id) placed in the NetIDE header. First, a Backend registers itself by using the following schema: backend-<platform name>-<pid>. data = " backend -< platform_name >-<pid >"
Once a Backend has successfully registered itself, it can start registering its modules with the same procedure described above by indicating the name of the module in the data (e.g. data=”Firewall”). From this point on, the Backend will insert its own module_id in the header of the messages it generates (e.g. heartbeat, hello messages, OpenFlow echo messages from the client controllers, etc.). Otherwise, it will encapsulate the control/configuration messages (e.g. FlowMod, PacketOut, FeatureRequest, NETCONF request, etc.) generated by network application modules with the specific +module_id+s. Upon a successful connection with the Core, the client controller must immediately send a hello message with the list of the control and/or management protocols needed by the applications deployed on top of it. data contains one 2-byte word (in big endian order) for each protocol, with the first byte containing the code of the protocol according to the above enum, while the second byte in- dictates the version of the protocol (e.g. according to the ONF specification, 0x01 for OpenFlow v1.0, 0x02 for OpenFlow v1.1, etc.). NETCONF version is marked with 0x01 that refers to the specification in the RFC6241, while OpFlex version is marked with 0x00 since this protocol is still in work-in-progress stage.